Zombie Marge Comix Group Blog: Happy Free Comic Book Day! Since I don’t celebrate those phony manufactured Hallmark holidays, I have to pick and choose from what’s left. I’ll hug a tree on Arbor Day. Groundhog Day is always a good time to reflect on the relationship of the weather to seeing one’s shadow. And April Fools Day was made for me. By far, the best non-holiday is Free Comic Book Day! As I’m not a consumer of mainstream comics, I don’t darken the doorway of my local shops all that often. Only enough throughout the year that they know my name and push the stuff no one else will buy when I come in. Don’t get me wrong; we have many fine comic establishments here in the Cincinnati area. I’m just not there week after week on new comic day to see what DC and Marvel are warming over and foisting on the public. For me, the glory days of superheroes ended decades ago. I’m no longer the target audience. I accept that. But Free Comic Book Day is different. I love seeing adult fans introducing their children to comics for the first time. It took a few years for the publishers to realize the potential, but they seem to produce more kid-friendly books this time of year. In the sixties there were plenty of comics aimed at younger readers. You could start with a few funny animal books; enjoy them for a few years, then “graduate” to the superhero titles. At least that’s the way I did it. There are far fewer comics aimed at the younger reader these days, but many of them are worth seeking out. I’ve been impressed with The Muppets, SpongeBob Squarepants and the new Popeye. 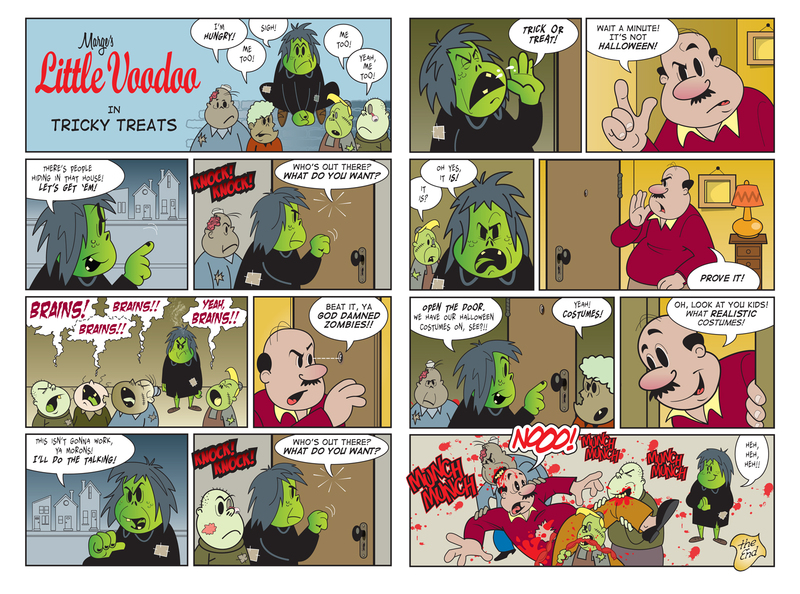 So, in honor of Free Comic Book Day, have a free comic from your pals at Zombie Marge Comix. 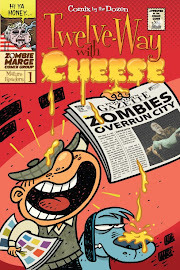 This is a story from the Twelve-Way with Cheese anthology. 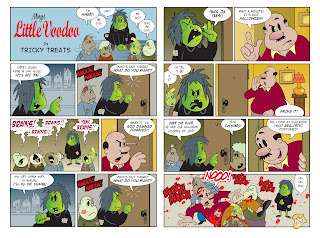 As this is Zombie Marge’s favorite comic character, you may see some more of Little Voodoo in the near future. Enjoy your day! I play lot of Play Zombie Survival Games games, been trying to find a decent book based on games but I couldnt! any1 wanna help me out?